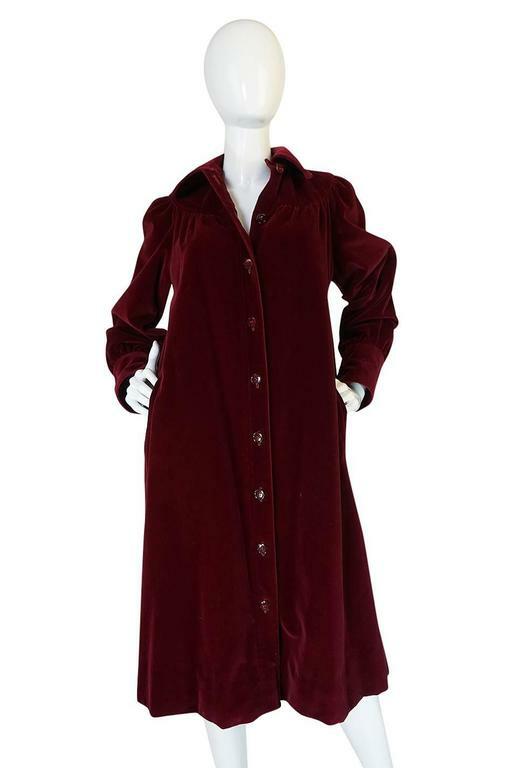 I love this great little Yves Saint Laurent coat that is made of a luxurious deep garnet colored velvet. I have had a couple of coats similar to this one before but each one I have had before this one had a Rive Gauche tag whereas this one has the couture YSL tag. That makes it that extra bit special. It is not a numbered tag and I believe this was the tag used for customs or special orders so this would be considered to be demi-couture. The cut of the jacket is loose and easy and reminds me a bit of a painter's smock with a nod to the renaissance period thrown in for good measure. The sleeves are fabulous with each of them cut with a bit of volume over a extra wide cuff that you can wear flipped up or unfolded. The body of the jacket is cut so that it widens out a it as it nears the hem. It buttons to close all down the front and pockets set on each hip. I love the top stitching detail around the shoulder that carries through and around the upper back. Fabulous and a great way to mix in a little vintage Yves Saint Laurent into your current wardrobe. Excellent condition. 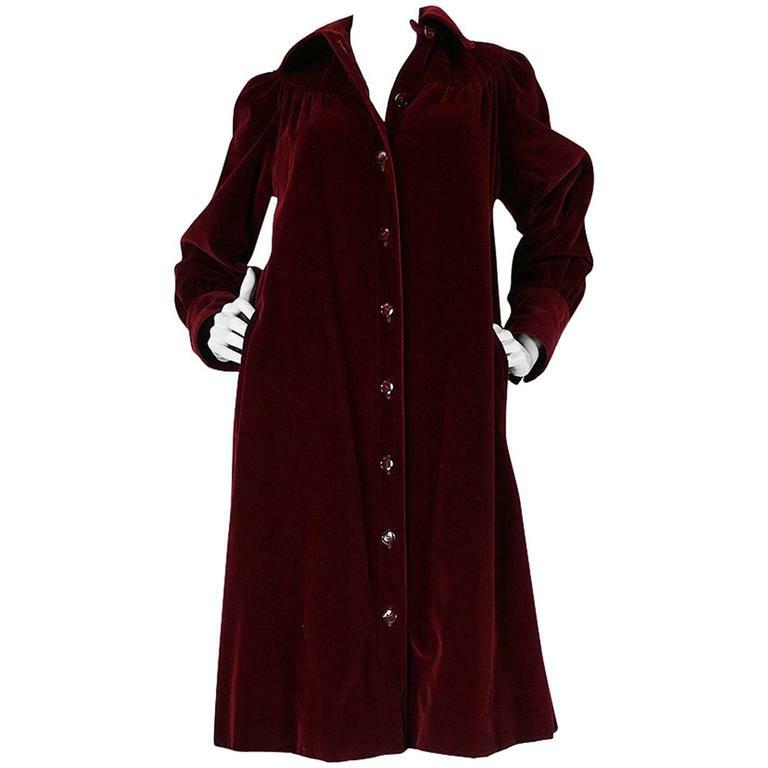 Fully lined in a deep red silk and buttons down the front. Front pockets at each hip. Hand finishes. I see a couple of flat spots on the velvet and the pricing reflects this. They are very minor. Sleeves: 25" Slightly inset shoulders: 14.5" Bust: 21" flat across from side seam to side seam Waist: 23.5" flat across from side seam to side seam Hips: 25.5" flat across from side seam to side seam Length: 40" from neck to hem Modern Sizing Equivalent: SML-MED Send us a note to see this Reference Photo: Yves Saint Laurent F/W 1981 Runway Collection. This garment has been professionally cleaned, pressed and is odor free. Thoroughly checked over before shipping, it will be ready to wear upon arrival. I see a couple of flat spots on the velvet and the pricing reflects this. They are very minor. Please expand description above for full measurements.